Pool water, equipment and surfaces can become discolored due to contamination, sunlight and the presence of metals in pool water. Metals are often introduced into the water via source water, equipment (corrosion of heater parts), pool chemicals or other pool devices. 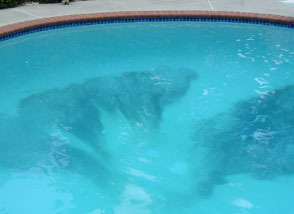 Changes in water balance (usually from an increase in pH or application of a shock product) can cause the metals to become insoluble and allow them to drop onto the pool surface, resulting in staining. Iron and copper are the two most common type stains. Some stains may be organic in nature (such as black algae and pink slime) and should be treated with algicides and shock.